From the wellhead to the consumer, natural gas pipeline systems provide us with a clean and efficient source of energy. There are essentially three major types of pipelines along the transportation route: gathering systems, transmission systems, and distribution systems. Gathering pipeline systems gather raw natural gas from production wells. Transmission pipeline systems transport natural gas thousands of miles across many parts of the continental United States. Natural gas distribution pipeline systems can be found in thousands of communities from coast to coast and distribute natural gas to our homes and businesses through mains and service lines. Except for gas service lines, the pipe used in natural gas pipeline systems can range in size from 2 inches to 42 inches in diameter; gas service lines are generally from ½ inch to 2 inches in diameter. Natural gas gathering and transmission pipeline systems are constructed from steel pipe. 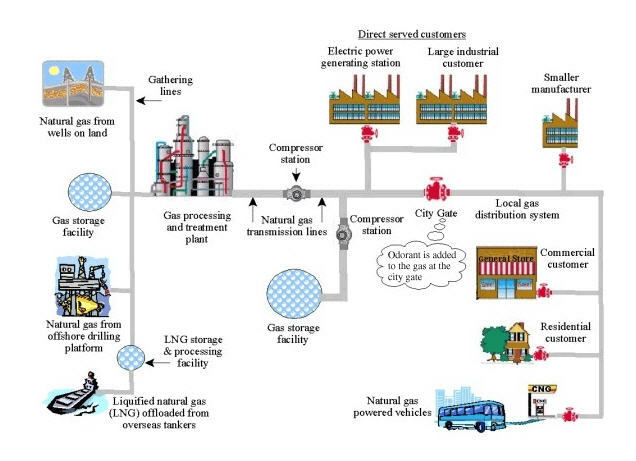 However, natural gas distribution systems have been constructed from many different materials including cast iron, steel, copper, and plastic pipe. Plastic pipe is most commonly installed today for gas distribution systems. Natural gas pipeline systems are owned and operated by many different companies. The location, construction and operation of these systems are generally regulated by federal and state regulations.